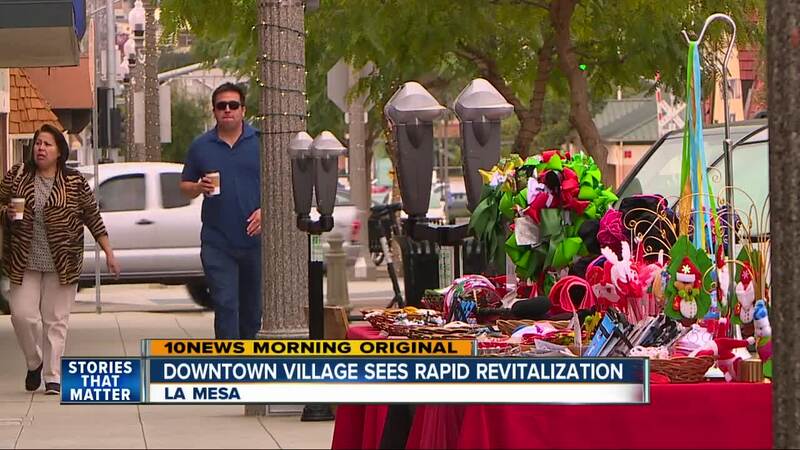 LA MESA, Calif. (KGTV) - A handful of new restaurants and events in Downtown La Mesa are giving the business district new life. In the last two years, around a dozen new restaurants have opened to lure people to the Village, including Bo Beau, Fourpenny House, Curbside, Surf Rider and Sheldon's Service Station. Those openings, combined with the street's highly popular Oktoberfest, Farmer's Markets, Holiday in the Village and other street fairs, have made the Village a destination stop for locals and tourists. "It's really, I think, the new hot spot in San Diego," said Village Association Chair Peter Soutowood. Soutowood owns Fourpenny House, and he said it's been a dream to see the area he's called home for years turn itself around. "I knew it was coming," said Soutowood. "I knew it was going to work. It just felt right as a small town." Soutowood points to areas like North Park and Little Italy as the inspiration for what La Mesa has tried to do. The neighborhood got an assist from the city of La Mesa, which has spent more than $8 million on infrastructure upgrades to the street and sidewalks. That's made it easier for people to park and walk around. "It's changed so much in the last 6 or 7 years," said longtime La Mesa resident Susie Sterling. "A lot of these shops were boarded up because it was an old town. And then, little by little, it just started catching on. I'm really happy about it." Business owners also say it's easy to get to, with an MTS trolley stop just a block away and easy access from state Route 125, Interstate 8 and state Route 94. "There's excitement, vibrancy," said Gy Kirk, COO of Sheldon's Service Station. "You'll see grandmas, grandpas, high school students, new moms and everything else mixed in. It's a melting pot for us." Kirk said he and other investors have also tried to maintain a sense of the area's history, keeping the small town feel of the neighborhood as they work to modernize it. "Why wouldn't you?" he asked. "You have to give back to the people who were the grassroots of what we are now." The Village Association plans to celebrate the area's success this weekend. Their "Holiday in the Village" festival begins Friday night at 4 p.m. and continues through Saturday. It will have street vendors, rides for kids and a concert stage. "We say over and over, 'A rising tide raises all ships,'" said Soutowood. "It's absolutely true ... A whole new generation of people is coming into the village to really take advantage of all this."